Cannabis stocks are looking to put the past behind them and move forward. 2018 was a huge year for the cannabis industry. Key events like the legalization of recreational pot throughout Canada led to huge new sales opportunities for budding marijuana producers, and investors got familiar with some of the first-moving names in the space. Yet from an investing standpoint, 2018 wasn't great for marijuana stocks. Some individual companies saw their shares lose huge amounts of ground, and even diversified investments like the exchange-traded fund ETFMG Alternative Harvest ETF (NYSEMKT:MJ) weren't able to avoid substantial losses for the year. Even so, Alternative Harvest has gotten off to a great start in 2019, and bullish investors are hopeful that the new year will bring a newly positive attitude toward cannabis investing once again. 2018 was an up-and-down year for Alternative Harvest ETF. Rather than creating a new fund from scratch, fund manager ETFMG instead decided to take an existing ETF with a completely different investing focus and transform its investment objective to concentrate on companies with business models connected to the cannabis industry. That fairly broad set of parameters allowed Alternative Harvest to invest in pharmaceutical companies looking at cannabis-derived medical treatments, suppliers of packaging and accessories for marijuana products, and plant fertilizer specialists as well as traditional growers of raw cannabis plants. Despite early enthusiasm, investors saw the sector struggle in the first half of 2018. Sluggish progress toward meaningful change in the industry seemed to cool sentiment toward marijuana companies, and it became unclear whether the tiny players in the space would be able to produce meaningful growth at the pace of the overall industry. That all changed coming into the late summer and early fall, as the impending opening of the Canadian cannabis market to recreational use approached. By September, the ETF had recovered its losses and was up 30% for the year, and even after volatility ensued, the fund shares sustained those gains for several weeks. Yet after the Canadian market opened up, pessimism started taking root again. The inevitable challenges of opening up a retail market across an entire nation cooled investors' opinions about the likely pace of growth for major players in the space. For short-term-minded traders looking for a quick score, it became evident that marijuana stocks would take a while to grow to their full potential. By the end of the year, Alternative Harvest had fallen more than 20%. Data source: ETFMG. Information as of Jan. 8, 2019. So far, though, 2019 is painting a much different picture. The ETF has jumped more than 12% in just its first week of trading, and cannabis investors seem to be focusing more on the prospects for fundamental growth. Patient shareholders understand that new markets will take months if not years to develop fully, and the companies that have put themselves into leadership positions are most likely to reap the long-term benefits of favorable market trends. In particular, Alternative Harvest has largely cast its lot with the best-known growth stocks in the business. Cronos Group (NASDAQ:CRON) is by far the largest holding in the ETF, with almost 14% of assets. Canopy Growth (NYSE:CGC), Aurora Cannabis (NYSE:ACB), and Tilray (NASDAQ:TLRY) each have 6% to 7% allocations within the fund, adding up to almost a third of ETF assets going toward these four stocks. Still, not everyone thinks those growers will be the best opportunities in the marijuana space. Some investors think that providers of ancillary products and services will do better. So far, Alternative Harvest doesn't hold shares of several promising marijuana stocks, including real-estate specialist Innovative Industrial Properties (NYSE:IIPR) and packaging designer and producer KushCo Holdings (NASDAQOTH:KSHB). It's possible the ETF could take a closer look at those stocks in the near future. There's plenty of uncertainty in the marijuana industry, and cannabis players are vying for position among both consumers and investors. 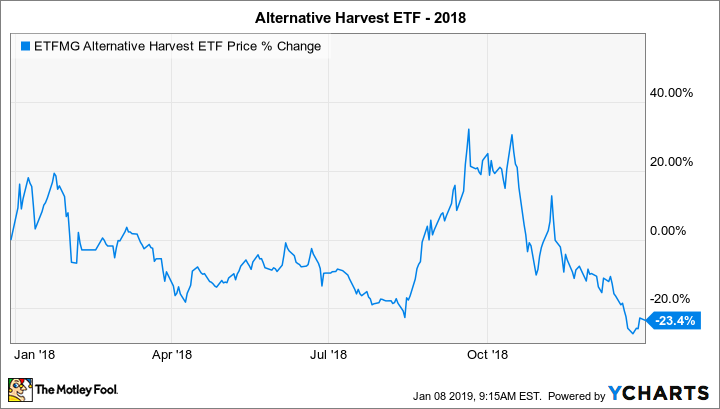 Alternative Harvest's losses in 2018 were disappointing, but its solid gains so far in 2019 point to a potential recovery that could show the long-term investing potential of cannabis stocks.